In Material Data, Samantha Bittman presents a new body of work including a series of paintings on handwoven textiles, custom digitally printed wallpaper, and a handmade tile floor sculpture. In Bittman's visual world, the structuring and processing of individual parts generate a mutually dependent relationship between image and object, while simultaneously conjuring formal and conceptual parallels across media. In her paintings Bittman exploits the limitations of the basic floor loom. By designing and executing weave drafts, which consist of simple sets of numerically based instructions; she generates woven cloth whereby the architecture of the weave interlacements and the graphics of the cloth are one in the same. Once stretched over traditional painting stretcher bars, the textile patterns, which often become distorted by the act of stretching, direct and dictate the painted surface. These moves are both intuitive and logical. In several works, the weave graphics are replicated precisely in paint, negating the materiality of the textile in favor of the pictorial aspects of the cloth. In other instances, selectively painted areas merge with their underlying textile support, further flattening the picture plane and perceptually disorienting the viewer. 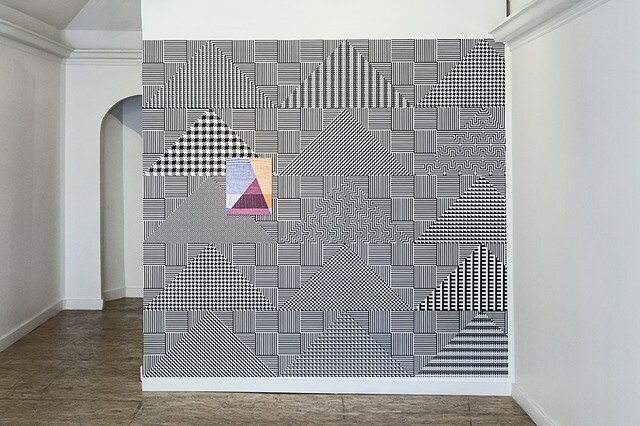 Optically frenetic wallpaper - a collage of graphic patterns originating from the interlacements in Bittman's paintings - references the relationship of the woven textile to Photoshop pixels, as well as the influence of weaving technology on the development of modern computing. Bittman's handmade tile floor sculpture is another example of tangible data organized into a meaningful whole. Each tile represents a bit of information, laid out as a traditional textile houndstooth pattern. In weaving, the houndstooth motif is created by a combination of simple color striping of the warp and weft along with the woven structure itself. This pattern is often also found in her paintings.